The subclavian and innominate arteries provide arterial supply to the upper extremities and to parts of the intracranial vasculature. This chapter reviews key anatomic features and variations, and different types of disease processes affecting these vessels. Diagnostic strategies including clinical history, physical examination findings, and use of noninvasive tools are discussed. This chapter also reviews the indications for treating subclavian disease including important clinical entities such as subclavian steal and coronary–subclavian steal syndromes. Different treatment options including surgery (such as carotid–subclavian bypass) and endovascular approaches are discussed. Of note, surgical treatment remains the definitive treatment of thoracic outlet syndrome. 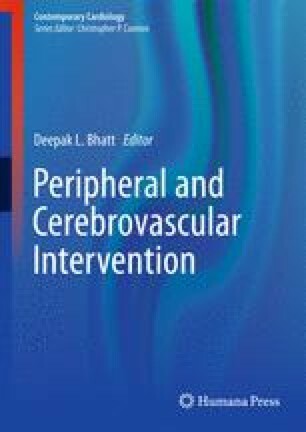 This chapter also addresses important concepts in angiography of the upper extremity arteries, treatment strategies, as well as the different types of equipment (balloon-expandable vs. self-expanding stents) and techniques (e.g., telescoping access technique) available in modern practice. Key concepts include recognition of the importance of aortic arch anatomy in determining guide or sheath selection; and identification of the origins of key branches (internal mammary and vertebral arteries), which may be affected by stenting of the subclavian artery. The role of retrograde recanalization via a brachial or radial approach is also discussed. Finally, procedural outcomes and complications are reviewed.